While some people have been coughing for years, the cause of a cough can be determined in at least 90 percent of these cases. Therapies for a cough have a success rate of at least 85 percent, and therefore, treatments should be aimed at the underlying cause, rather than just medications that cover up a cough temporarily. The cause of a cough is dependent on how long the symptom has been present. For example, the causes of an acute cough may be quite different from the causes of a chronic cough. In at least 25 percent of cases of a chronic cough, there are at least two medical conditions causing the cough in the person. The cause of an acute cough is usually determined by the person’s history and physical exam. Some experts will use an antihistamine/decongestant combination (such as Dimetapp or the equivalent generic) in the treatment of an acute cough due to the common cold. Newer antihistamines/decongestants, such as Claritin-D (loratadine/pseudoephedrine), do not seem to be as helpful. People who continue to cough despite the treatment for a common cold, or who have other signs of an acute sinusitis, are given a course of antibiotics aimed at sinusitis as a reason for an acute cough. Children appear particularly prone to having a cough as the only sign of a sinus infection. Those with underlying COPD (emphysema or chronic bronchitis) may have exacerbations with an increase in a cough, shortness of breath, wheezing and change in mucus production and color. Antibiotics are typically given to these people with an acute cough. Whooping cough, or pertussis, is becoming more in certain communities, and vaccination does not always provide complete protection. People with Pertussis will have severe episodes of coughing, often with vomiting after a cough. Treatment with antibiotics helps if given early in the infection; otherwise, the cough may become chronic and last for many weeks. Rhinitis (allergic and non-allergic) may also cause a cough that is related to post-nasal drip (phlegm draining from the back of the nose into the throat). However, this may be a very different cough from the above and more of a throat clearing type of cough. 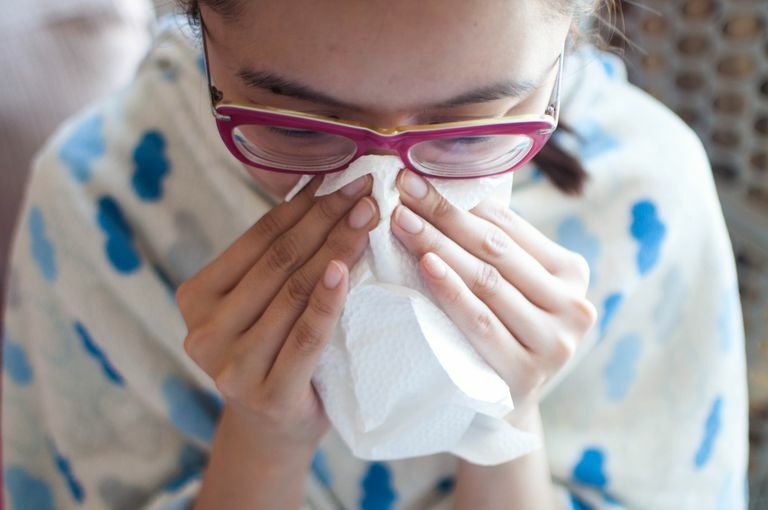 Allergic rhinitis will respond to various allergy treatments while non-allergic rhinitis may only respond to decongestants or various prescription nasal sprays. Less common, but more serious, causes of an acute cough include heart failure, pulmonary embolism, pneumonia and getting a foreign object lodged in the lung (aspiration). A post-infectious cough is a cough that has persisted after a common cold or other viral respiratory tract infection, in which there is no pneumonia. It can be a result of post-nasal drip or bronchitis. These symptoms may resolve without treatment or may become an acute sinusitis requiring antibiotics. Some experts will give a trial of a decongestant/antihistamine combination (such as Dimetapp or the generic equivalent) for one week, and if this fails, a trial of antibiotics. If a person also complains of shortness of breath, wheezing, or chest tightness, then asthma may be the cause of a cough. Usual treatments for asthma would then be given. A cough lasting for more than eight weeks is termed a chronic cough. Some people can experience a chronic cough for years, and treatment may not be successful. For these people, a referral to an allergist or pulmonologist (a physician who specializes in the lungs) should be made, as expert medical care may be needed. Many experts recommend performing a chest X-ray and a cat scan of the sinuses as part of the evaluation for a chronic cough. Specialists (allergists and pulmonologists) will also perform specialized tests for asthma. When a chest X-ray is normal, then the above causes account for the overwhelming majority of cases of chronic coughing. The physician will perform a history and physical examination, which may give clues to the cause of the chronic cough. In some instances, it may be necessary to give trials of treatment for the above, as the physical examination may not give clues to the cause of the cough. People who smoke or who are exposed to irritants in a job or hobby should avoid these triggers. Medications such as ACE inhibitors (blood pressure medications such as lisinopril and many others, with the generic names all ending in “pril”) are well-known causes of coughing and should be switched by the physician to a different type of medication. A cough may last for up to four weeks after an ACE inhibitor is stopped. This is the most common cause of chronic cough. Post-nasal drip, if present on the history (throat-clearing) or on the physical exam, may be treated with a decongestant/antihistamine combination (as above in acute cough) and a prescription nasal spray (such as a nasal steroid). If these medications do not help, it may be necessary to ensure that the post-nasal drip is not due to a sinus infection by performing a sinus cat scan. Asthma is the second most common cause of chronic cough. A cough may be the only sign of asthma, although many people will also complain of wheezing and shortness of breath as well. Special tests, including spirometry and bronchoprovocation studies, can help determine if the cough is due to asthma. However, these tests may be normal, so a trial of asthma therapy (such as an inhaled steroid) may be needed for approximately one to two months. GERD is the third most common cause of chronic cough, and the majority of people with this type of cough do not realize that they have GERD. Another form of GERD, called laryngopharyngeal reflux (LPR), causes a cough with a hoarse voice and throat clearing. Specialized testing can be performed for GERD and LPR, but in the types that cause a cough, these may be expensive and uncomfortable. A trial of therapy for GERD and LPR (the treatment is typically the same), typically for many weeks to months, may be needed for the cough to resolve. This form of chronic cough occurs in up to 13 percent of people and can be diagnosed with looking at the person’s sputum (phlegm) under a microscope. Because there is no other testing available to diagnose this type of cough, a trial of inhaled steroids (for one to two months) is often part of the therapies given to a person with a chronic cough when the cause is not readily apparent. If the cough persists despite the above, referral to a specialist (allergist or pulmonologist) may be required for further evaluation. Less common causes of chronic cough include habit cough (nervous tic), ear wax (or other foreign body) impaction in the ear, Tourette’s syndrome, various types of lung cancers, heart failure, interstitial lung diseases, etc. Irwin RS, Madison JM. The Diagnosis and Treatment of Cough. N Engl J Med. 2000; 343: 1715-21. Weldon DR. Differential Diagnosis of Chronic Cough. Allergy and Asthma Proc. 2005; 26: 345-51.